It’s that pumpkin time of year. Pumpkins stacked artfully on every doorstep. Pumpin crafts in every elementary classroom. Pumpkin-shaped dishes and pumpkin-colored sweaters. And don’t even get me started on the food. Pumpkin spice lattes are only the beginning. Now we have pumpkin spice cookies. Pumpkin spice cereal. Pumpkin spice tortilla chips. Even our beloved peanut butter cups have mutated into pumpkin form for the season. I have no fewer than six pumpkins by my front door. I own an orange shirt (something I once swore I would never do). Pumpkin spice is my middle-aged white lady jam. Happily, I’m not so young that I can’t make fun of myself for it. And I’m not so old that I can’t question how I got here. Why have we become so crazy about pumpkins? Sure, it’s a fall vegetable, but so are other kinds of squash, not to mention cabbage and kale. You don’t see anyone obsessing over cabbage season, do you? Obviously this is a very clever marketing scheme. But why does it work so well? Then the other day, it hit me. I was cleaning up toys in our playroom (like some kind of family-member-turned-slave) and I saw the picture. You see that one up there? 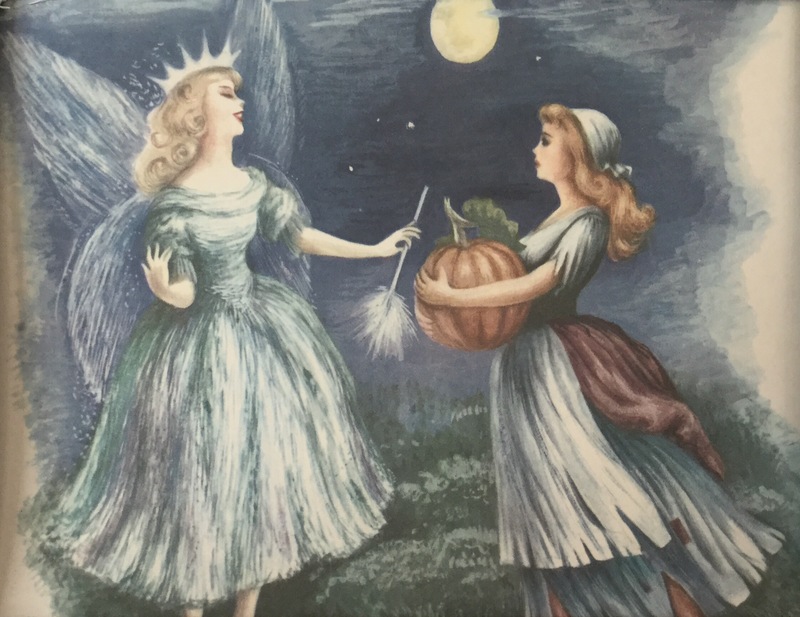 It’s from an old Cinderella book I found at a thrift store. The illustrations charmed me, so I framed them and hung them up to smile down on my playing children. And there it is. Cinderella, holding the pumpkin which is about to take her to a ball to meet the love of her life. No wonder we’re so obsessed with pumpkins, ladies! They are embedded in our mythology as our transportation to bliss. Think about it. A plain lump of a vegetable, left in the garden after everything else had been harvested, gets chosen to be transformed into something special and lovely. It won’t last forever. The magic ends at midnight. But no one will ever forget it, even after it’s gone. It will have changed the course of a girl’s life, and even the course of a kingdom. That pumpkin is potential. That pumpkin is hope. That pumpkin is us. And we are going to ride it away from our daily chores and into a palace of happily ever after. Too far? Tell me you haven’t thought a PSL would turn your day around. Tell me you haven’t lit a pumpkin scented candle and sat down with your pumpkin shaped treat of choice and taken a brief mental vacation. I’m not saying that if a cabbage had been all that poor girl had left in her garden, we’d all be drinking cabbage spice lattes today. I’m just saying that there’s a correlation. Our cultural stories have far-reaching affects, and this one is no exception. So hold your head high as you buy those mini-pumpkins and speak up when you order your pumpkin bagel with extra cinnamon cream cheese. You are part of a proud tradition of women taking leftover vegetables and making them into something magical. It’s not the solution to all our problems, but it’s a decent way to make it to midnight.